This pic is currently #1 in my photostream's list of interestingness (by flickr). Took this shot within the Yamashita Park port area. 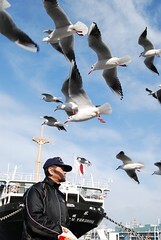 Man in view, I think is some sort of a park attendant, attracting seagulls with some 'Oishi' crackers at hand. This was also my very first major break-in for a month old D40x. Joined TF photo hobbyists as we walked from Yamashita Park -> Akarenga -> Chinatown.